9 cm Thin NEOPLANO Memory Foam Pillow, Made in Italy, Highly Breathable Classic. Happy is a pillow that offers all the benefits of top-quality viscoelastic memory foam, particularly with regard to breathability, thus offering a perfect base for sleeping on. The pillow is 9 cm high, making it ideal for those who prefer to sleep on a thin support, though without giving up the excellent anatomical performance of memory foam which this thin pillow also offers. The Viscoelastic Memory Foam interior, which is highly flexible and breathable with open cells, allows for a better distribution of the weight exerted by the head and leaves the neck free from excessive pressure. Its solid density keeps its original shape even after years. Protected by knitted cotton jersey, it doesn't require any special care, just a sheet is all it takes. Brand: NEOPLANO Model Number: guan21 Colour: White Item Weight: 1.1 Kg Product Dimensions: 72 x 42 x 9 cm Material: Cotton Special Features: Ipoallergenico, Traspirante. Made in Italy: top-quality Memory Foam with protective cotton jersey cover. 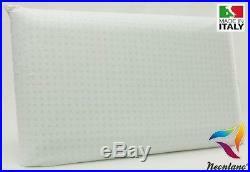 Memory Foam pillow perforated to guarantee maximum breathability and hygiene. Height 9 cm, for those who prefer a thin pillow. Non-toxic Materials, Free of Emissions or Electromagnetic Fields, Recyclable. Covered with a protective stretch-knit fabric in 100% white cotton jersey. Our stock all ships from our UK based warehouses. Only factory defects are accepted as a reason for a return. We do our best to process as quickly as possible. We guarantee that your issue will be solved quickly. We usually respond within 24 hours on weekdays. The item "9 cm Thin NEOPLANO Memory Foam Pillow, Made in Italy, Highly Breathable Classic" is in sale since Tuesday, July 11, 2017. This item is in the category "Home, Furniture & DIY\Bedding\Pillows". The seller is "**favouchoic**" and is located in Multiple Locations.